So what happens when you are a dancer, professionally or in training and you suddenly and unexpectedly become paralyzed? Well, that is the story of our next guest. It also happens to be a story I share with her and has made me feel a strong connection to her. The difference is, Marisa Hamamoto’s paralysis was temporary. Her paralysis may have gone away, but the impact of that experience set the stage for what was to come, a story that will impress you and make you reconsider what you may have felt was impossible. Marisa’s is a story of passion and destiny and resolve. During our interview, you may want to ask yourself: what has your disability taught you…and what do you feel is your purpose and destiny. Everyone Deserves to Dance! Everyone Can Dance! Dance is Transformational! We All Have a Dancer Inside of Us! Marisa will discuss the purpose of creating this program and explain what the Dance Company is comprised of currently. What are some of the challenges you have faced and currently face in building this program and company in your community? What has been your experience in seeing how people with disabilities feel impacted by dance? How exactly do you teach people in a wheelchair to dance? What is the study and curriculum methods behind this process? I recall you talking about your spending 5 hours in a wheelchair in a mall once. What was that like? How do you feel we can best impact the view of disabled –the fear, stigma and often aversion people feel? What is your big picture goal? Where do you see the company evolving over the next 2-5 years? Is there an opportunity for our listeners to become involved in their communities? How can they make dance a part of their lives locally? Hey Buddy!, I found this information for you: "PUSHLiving Podcast 013 | So you Wanna Dance? Marisa Hamamoto Infinite Flow A Wheelchair Dance Company". 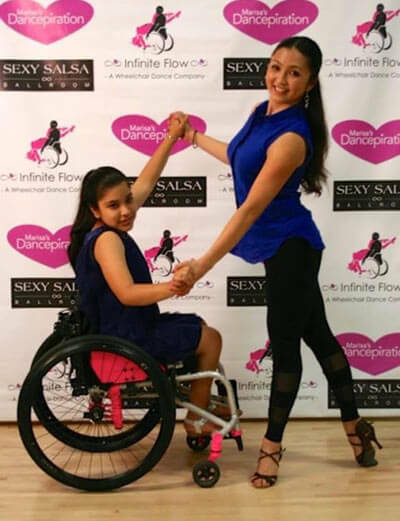 Here is the website link: https://pushliving.com/pushliving-podcast-013-so-you-wanna-dance-marisa-hamamoto-infinite-flow-a-wheelchair-dance-company/. Thank you.